Vitra Miniature Chair, new in wooden collectors box with brochure. Vitra original miniature chair. This amazing and highly detailed miniature is an exact copy of the original large version from Herman Miller! This miniature is very rare and is not available anywhere else. The miniatures come in a wooden box with a brochure which provides art-historical information on the background to the design, biography of the designer, and the production history of the respective chair & ottoman. 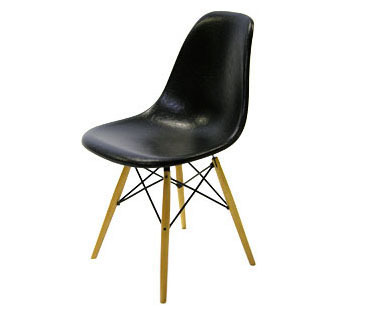 Miniature DSW chair, Designer: Charles & Ray Eames, 1950. For the first time in the history of design Charles and Ray Eames used the excellent shaping qualities of glassfibre-strengthened plastic to develop a comfortable shell adapted to the shape of the human body.